Online private shopping club sites, such as Europe’s Vente Privee – which founded the concept in 2001 in France – and Singapore-based Brandsfever, usually target higher-end, premium fashion customers. An interesting twist to this concept launched earlier this year in August is US-based Kembrel, a campus-focused private shopping community catered exclusively for students. First launched at the hallowed University of Pennsylvania, the site partners with major fashion brands and offers massive price discounts to college students of 45-75 percent off for clothing, shoes, accessories and more. 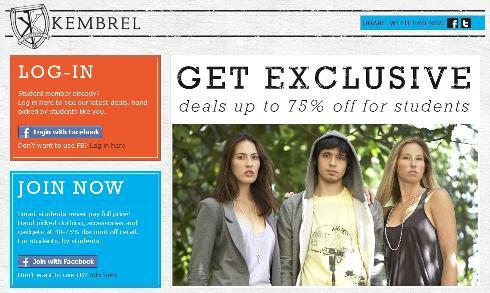 It’s also the first private-sales store that can be accessed entirely through Facebook, from browsing to checkout. “By bringing our store to where our customers spend the most time online, our goal is to provide them with the most convenient and relevant shopping experience,” say Kembrel‘s CEO Cherif Habib. It’s safe to say most youth love their shopping, and they love new stuff. In fact, so much so that a successful beta in the summer saw Kembrel attract some 20,000 registered student members, mainly through word-of-mouth. Even today, it is growing at around 5,000 new members every week. Attracted by the potential, more than 50 brands to date have signed up to offer their products to Kembrel‘s student community. “From our previous work experience, we knew that it was a common problem for smaller brands to reach the student market effectively,” says Cherif. “We offer a direct marketing channel to a niche demographic untapped by other private sales sites, as well as a chance to build brand loyalty among an educated, trend-savvy and young demographic,” addss Valerie Muvdi, a buyer at Kembrel and herself a recent college graduate. Staying true to their college roots, the Kembrel team involves a close-knit community of student contributors in all aspects of the company. During a typical day at Kembrel’s studio, photography majors snap product shots featuring aspiring student models. Journalism, marketing and public relations students pitch in to write content and help with publicity. “Our commitment to developing student talent has helped us maintain an authentic voice and keep our costs low, while providing college students with invaluable professional experience,” says CTO Stephan Jacob. Kembrel also introduced a pop-up shop campaign (read here for more on pop-up stores) when Harvard, on September 25, transformed into a sample sale haven where students jumped at deals on everything from clothing to shoes, computer accessories, dorm essentials and more. The mobile stores were like a physical manifestation of its online student-run community – and a first-hand, close-up look on how Kembrel works. “Being able to touch and feel the merchandise first-hand brings credibility to not only to the merchandise, but to Kembrel as well,” Cherif explains. “This is also a great opportunity for those who don’t shop online as often to incorporate a new and fun habit into their daily life that’s exciting and easy.” More pop-up shops in other campuses are being planned. 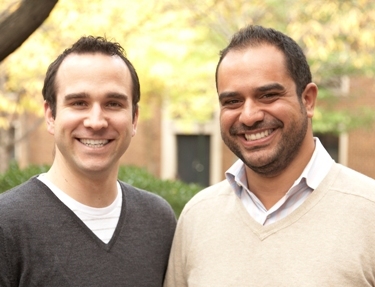 Kembrel founders Cherif Habib and Stephan Jacob are Wharton MBA students who first met at Wharton Founders Club, an informal group they started for students who have founded businesses prior to entering the school’s MBA program. They both came to Wharton with the goal of starting a business, had several common interests and connected extremely well on a personal level, Cherif reveals. Balancing schoolwork and Kembrel can get tricky sometimes, but Cherif is confident they’ll make it work especially now that the team at Kembrel numbers five full-time staff, including both founders. He is very proud of how fast the site has acquired members, and is delighted at the positive feedback they’ve gotten from customers so far. On the same note, he’s crushed when they’ve disappointed customers by being late on some orders. “We are doing our best to avoid these rare situations and are grateful to our customers who have been very supportive so far,” he says. Kembrel has also garnered quite a number of accolades, landing a People’s Choice Award at the Wharton Business Plan Competition 2009-2010 finals, and Wharton’s various venture support initiatives such as the Wharton Venture Award and the Snider Seed Award. The team has invested most, if not all, of the award funding they’ve gotten from Wharton into Kembrel – about US$15.5K in total – and bootstrapped the rest from their savings. They do get free office space at Wharton’s incubator. “We are not looking for outside investors right now,” says Cherif. Kembrel founders Stephan Jacob (left) and Cherif Habib. One of the most important lessons he’s learnt as an entrepreneur so far is the importance of taking a step back regularly and take in a macro view of things for a better perspective. “It’s easy to get caught up in the daily emotional roller-coaster of running a startup,” he says.